Monday - April 1, 2019: I a new page about Outhouse Grove, in Elk Falls, Kansas, which I visited yesterday morning. 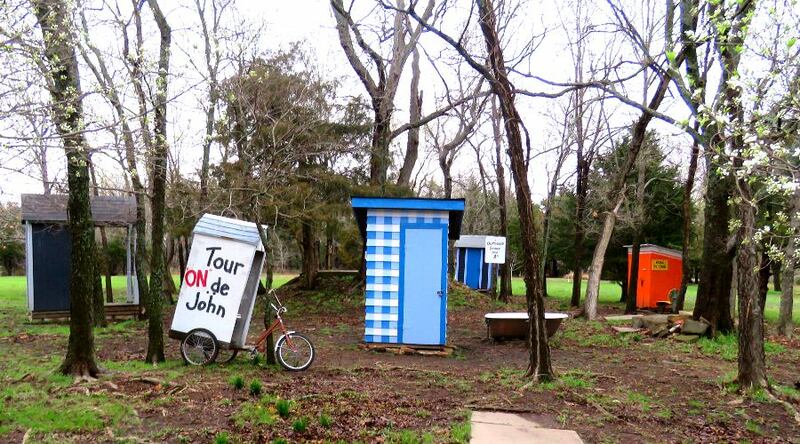 Elk Falls is the self proclaimed Outhouse Capital of Kansas and hosts an open house and Outhouse Tour on the Friday and Saturday before Thanksgiving each year. This new grove gives people a handy photo opportunity year around. Tuesday - March 2, 2019: I had supper at Mass St. Fish House & Raw Bar in Lawrence, Kansas, which opened 2 years ago in the old space which was once occupied by Buffalo Bob's Smokehouse. The menu lists many small plates, but only 7 entrees. I went with a small plate (grilled oysters) and an entree (Mass fish & chips). There were 6 small oysters in the $15 small plate. I was expecting the grilling to have added something to the appearance and flavor of the oysters, but though the server warned me that the shells might be hot, it was more like slightly warm raw oysters on the half shell. The $15 wild Alaskan cod with French fries was much better, The fresh cut fries were not crispy, but still tasted fairly good and the deep fried cod had come out just right. At that price points, I would have liked there to have been one more piece of cod than the two small pieces on this dish. The service was very good and there were definitely other items on the menu that looked interesting to me. I would like to try them again, though the menu will probably have rotated before I will get there again. On my way back to the car, I spotted a mural on the side of one of the buildings on Mass. I photographed that mural, along with two which I found on Vermont Street on the way to Public Library, one of which was actually on the outside of the library. I also took photos of the beautiful 1904 Carnegie building, which is the former Lawrence Library. Today the building is operated by the Lawrence Parks and Recreation Department as an event and meeting space. I was on my way to the current library to see a presentation, "If These Walls Could Talk: Kansas Murals" by Dave Loewenstein, who had photos and talked about some of the 1,000 murals that you can find throughout Kansas. I was a little surprised at how many of the ones which he featured, I had already seen, but got leads on 2 I hadn't known about and one I have neglected seeing and really should. Wednesday - March 3, 2019: At lunch time, I revisited Toni's Italian Restaurant which opened in Olathe, Kansas last year. My previous visit was in November. 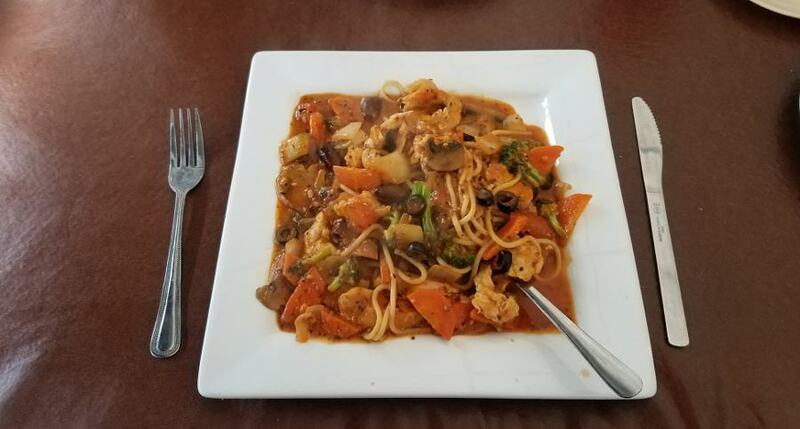 There are a variety of $8, $9 and $12 lunch specials and I had the $9 Chicken Diavolo (Sautéed mixed vegetables in fresh garlic and basil, served over spaghetti and spicy sherry wine sauce). That dish was fine, but what really impressed me were the house salad and warm, fresh rolls with oil & vinegar with herbs for dipping. The salad was simple but had plenty of good blue cheese dressing and I would have been happy with a meal of the bread and a larger salad. At supper time I checked out the new Fireside BBQ and Bar which opened in Overland Park, Kansas last Thursday. This the same location as the Fireside BBQ which closed last fall and is using the same sauce, but is otherwise changed. I was told that the owner lives a few blocks away and has other local businesses. This is his first restaurant. Fireside is a sports bar which serves BBQ. 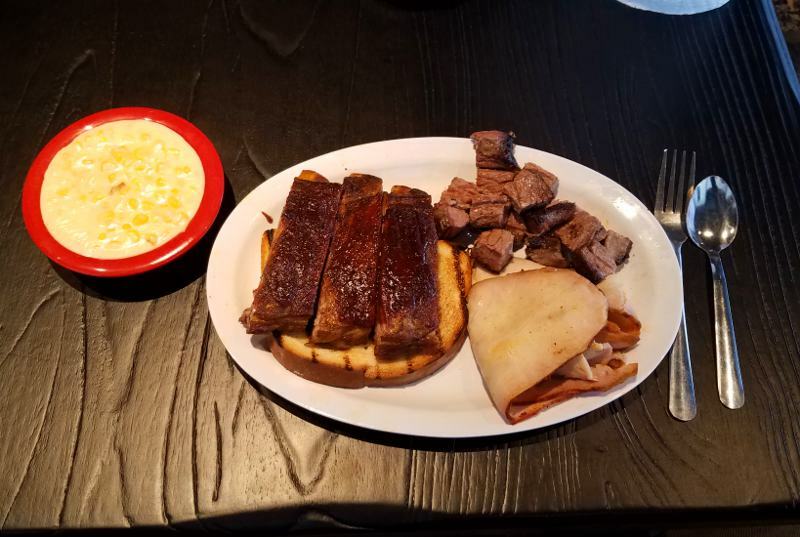 The burnt ends and cheesy corn were both quite good. The burnt ends needed no sauce. They had good texture and flavor without being as fatty as many. I felt that the pork ribs and turkey did need sauce. The ribs were tender without falling off the bone and pared fairly well well with the sweet sauce. The turkey was a little dry and also benefited from a little sauce. There were three sauces on the table. The original and Embers (hot) sauce were both sweet and thin. The "Sweet" sauce was thicker and had a more complex flavor. I expected a little more food at the price point oil. I usually have food to go, but ate all of the $17 combination dinner. Saturday - March 6, 2019: I drove to Leavenworth, Kansas to visit the two National Cemeteries and Fort Leavenworth. The first stop was Leavenworth National Cemetery, a 129 acre cemetery on the south side of Leavenworth, next to the Dwight D. Eisenhower VA Medical Center. It has well over 30,000 interments. While photographing the cemetery, I spoke to a security guard and learned that the Chapel of the Veterans is closed due to safety concerns and there are no current plans to reopen it. Passing through Leavenworth, this seemed like a good day to revisit Homer's Drive In. It had been several years since I last dined at Homer's and the review of the 88 year old restaurant was over due for an update. After confirming that their had been few changes to the menu, I ordered Mac's Homemade Chili. It is meaty, but not very spicy, probably a better choice on a hot dog or French fries, than as a bowl on its own. The server brought hot sauce at my request. The rules for gaining admission to Fort Leavenworth had changed since the last time I was there and while our pages about the fort had been updated with current information, I felt I needed to actually experience the changes. Visitors to Fort Leavenworth who do not have a Department of Defense issued ID card must now stop by the Visitor Control Center. It is near the Grant Gate and home Monday through Saturday. The building feels a little unwelcoming, but there was only one person in the waiting area and I soon saw someone who checked my identification, finger printed me, photographed me and ask detail question about where I would be going. In about 10 minutes I was on my way, with a one day pass which had my photograph on it. Presenting the pass at the gate, the process was much quicker than the past. The guard scanned the bar code on the pass and waved me through with no questions or inspection of the vehicle. Sunday - March 7, 2019: Added a new page devoted to the Military Prison Cemetery at Fort Leavenworth, which I discovered just yesterday. Tuesday - March 9, 2019: Added a new page devoted to the Grenola Elevator Museum in Grenola, Kansas. It is a neat museum occupying an old grain elevator and two one room schoolhouses which were moved to the location. Saturday - March 13, 2019: It had been a few years since I had visited Davenport Orchards & Winery in Eudora, Kansas and on an impulse I stopped there on my way to Lawrence this morning. I didn't know the hours, but when I pulled in the drive, there was an "open" sign on the door. The door was locked, but a smaller sign said to ring the bell twice and someone would be along in a couple of minutes. Greg Davenport came out of the house and opened the shop in less than a minute. We are fond of Davenport's non grape wines and I tasted the three that were available for tasting today. The apple was very sweet, much to my taste. The first "Peche" was also quite sweet and Greg recommends it for an after dinner wine, taking a sip and holding it in the mouth until the sweetness goes away. The third wine was "Peche Black Label," which is fortified with peach brandy made from their wine. It was my favorite. The Davenport Winery has fine art labels and that is a selection of the grape wine labels at the right. This trip to Lawrence was to photograph more of the public art and I started with a drive by the 4-1-1 Studio of Dave Loewenstein, the artist who made the presentation about murals earlier this month. I drove on to photograph two other murals before stopping for lunch at O Cafe Korean Restaurant. The dinning area is bright with lots of windows and quite attractive. The menu had photos of the dishes, which was helpful, as there were many unfamiliar dishes on the menu. I went with the Jjajangmyeon (pork belly with black bean paste sauce with noodles, topped with an egg). I chose the thin noodles and spicy. It had just the right amount of heat and was also slightly sweet. I had intended to take some home, but it was so good I couldn't stop. It came with just 3 banchan (side dishes). I like two of these a lot, but their servings were very small. There was just one server and the restaurant was pretty busy. She never came back to my table after bringing out the food, so I couldn't ask for more of the banchan. Another neat thing about this restaurant was the collectable items on sale, such things as framed memorabilia from the Tom Mix Circus and Emmet Dalton, as well as autographs from actors who portrayed munchkins in the Wizard of OZ, Jack Haley (the Tin Man) and automotive pioneer Charles Duryea. After lunch, I drove north of the Kansas River to the Visitors Center in the old Union Pacific, where I picked up some brochures to plan future Lawrence exploration. Heading back to the south side of town, I photographed several more murals and art installations. On the west side of Lawrence, I visited the new Leeway Butcher, in the same building as Leeway Franks. I bought some chorizo to take home. After putting the meat in the cooler, I stopped at Leeway Franks and ordered a chili dog. The frank itself was very good, with a great flavor and the casing offering just the right amount of snap as I bit into it. The chili was mild and they don't offer crushed red pepper or hot sauce with the condiments, but after I asked, they gave me a little paper cup with some hot sauce from the kitchen. The fresh cut fries are thick cut and were not cooked as much as I like. A couple of the fries were smaller and cooked much more to my taste. Since I was already on the west side of town, I stopped at Pioneer Cemetery, 165 year old Civil War cemetery on the University of Kansas campus. Several of the grave markers in the cemetery are from the burials of victims of "Quantrill's Massacre" on August 21, 1863. Sunday - March 14, 2019: Added a new page about the Salter House Museum in Argonia, Kansas. Updated the reviews of Smokin' Joe's BBQ in Olathe, Beef Burger Bob's in Neodesha, and Homer's Drive In, in Leavenworth.